EU Stakeholders Divided over Reforming the EU Emissions Trading System | Environmental Europe? The European Union Emissions Trading System (EU ETS) is currently the world’s largest market-based policy for reducing greenhouse gas emissions. Operating since 2005, the EU ETS sets a steadily-decreasing cap on the greenhouse gases that installations can emit in 31 countries. “Emission allowances”, tradable permits to emit one ton of greenhouse gases, are allocated for free or through auctions. 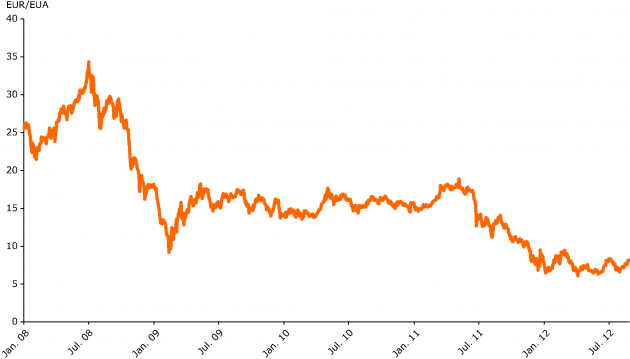 Since the 2008 global financial crisis, Europe’s continuing economic weakness and other factors have caused a large reduction in EU ETS-covered greenhouse gas emissions. In addition, companies have used emission reduction credits from developing countries to meet some of their obligations. 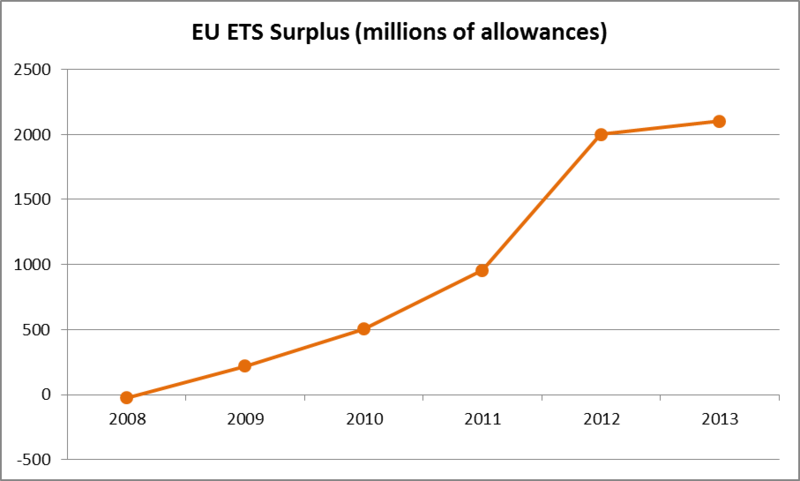 As a result, between 2008 and 2013 a surplus of around 2.1 billion unused allowances has built up in the ETS (Figure 1). This surplus is a major factor in the long-term decline of ETS allowance prices, which dropped to a low of under €5/allowance in 2013 (Figure 2). Figure 1: Surplus Emission Allowances in the EU ETS (2008-2013). Data from the European Commission. 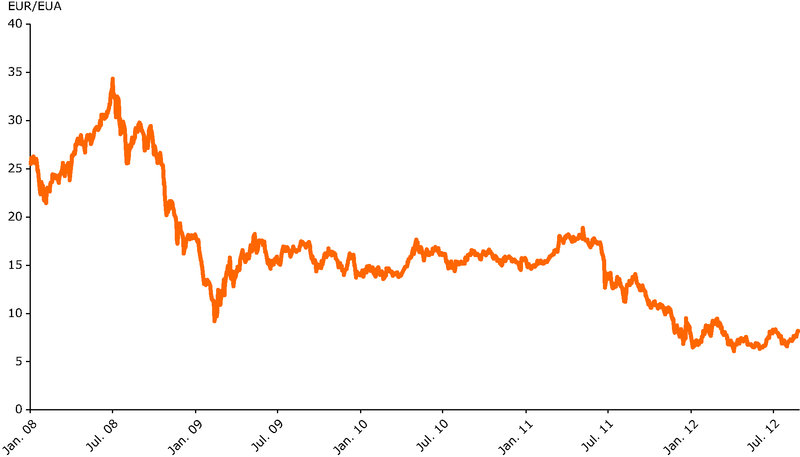 Figure 2: Emission allowance future prices in the EU ETS, January 2008 to August 2012. Image source: EEA. In its 2012 report on the European carbon market, the European Commission’s Directorate-General for Climate Action (DG Clima) argued that the EU ETS’s allowance surplus warranted a policy response because it posed a “…a real risk of seriously undermining the orderly functioning of the carbon market…” (pg. 6). At the time of the report, the Commission also put forward a “back-loading” proposal to delay the auctioning of 900 million allowances to temporarily reduce the surplus. Option F: Create a system to directly manage allowance prices. Cembureau: The European Cement Association. Change Partnership: an EU-level, climate-focused NGO. These respondents made up only 5% of the total, and should not be considered representative. However, they were chosen because they represent key EU ETS stakeholders. National governments hold a position of power both in EU policy making and the Commission’s consultations, the business associations represent sectors responsible for approximately 90% of 2013 EU ETS emissions, and the NGOs/networks represent 284 separate organizations. I coded each organization’s written submission as supporting, opposing, remaining neutral, or not mentioning structural reform options B-F. Support for the five policy options varied widely (Figure 3). Some policies, such as the removal of allowances and the tightening of the ETS cap, enjoyed significant support. Others, especially the direct management of allowance prices, enjoyed very low or no support. Figure 3: Support and opposition to structural reform options (14 organizations total). However, in some cases national governments, business associations, and NGOs held widely diverging positions on a policy option. For example, three of the four sampled NGOs supported permanently removing allowances from the ETS. In contrast, four of the five business associations opposed the move, and the national governments were split or did not address the issue directly. Another approach to exploring stakeholder positions is to look at how often individual organizations agreed with each other. 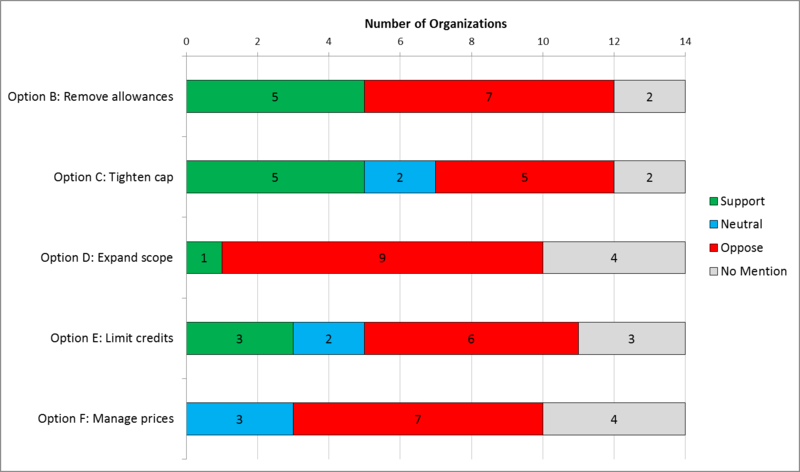 In Figure 4 below, each of the fourteen organizations is connected to another organization if they share a position on at least one structural reform option (support, oppose, or neutral). A red connection signifies that the organizations share opposition, a green line signifies shared support, a blue line signifies shared neutrality, and a grey line signifies evenly divided support and opposition. Each line’s thickness is determined by the number of policy options that two organizations agree on (out of five). Figure 4: Shared positions between stakeholders on proposed EU ETS structural reform options. Line thickness is based on the number of positions in common. Green lines: shared support of at least one option; Red lines: shared opposition; Grey lines: equal mix of shared support and opposition; Blue lines: shared neutrality. 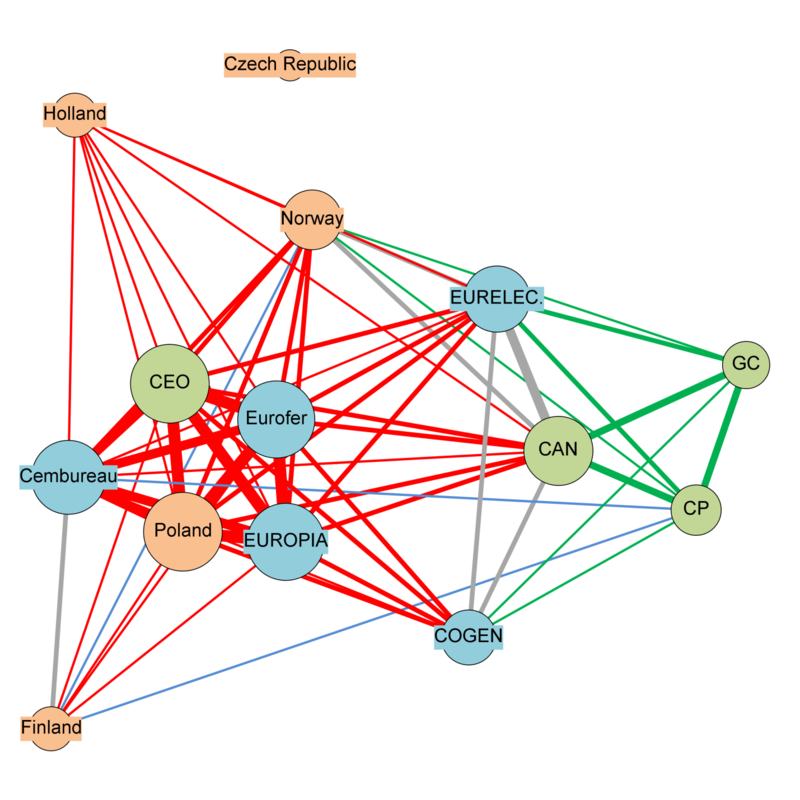 The left side of the figure shows a cluster of organizations centered on Poland and the energy-intensive industries (steel, cement, and refineries) which opposed all or most of the structural reform options. In contrast, the environmental NGOs on the right supported a number of policy options, namely increasing the EU ETS’s stringency and limiting access to international credits. Three outliers should be noted. First, unlike its business association counterparts, the electricity generation industry group (EURELECTRIC) supported a number of potential policy options and was closer to the environmental NGOs than to other industries such as steel and cement. Second, the Czech Republic did not directly address the six policy options, and so is not connected to the other respondents. Third, the NGO Corporate Europe Observatory (CEO) opposed every policy option and is closely connected with the energy-intensive industry/Poland cluster. However, the Observatory’s position is far removed from these other organizations. While the energy-intensive industries generally opposed structural reform before 2020 because of concerns about rising costs and uncertainty, the Observatory and its partners argued that the EU ETS cannot be fixed and should be abandoned in favor of other regulatory instruments. My analysis above is a narrow snapshot of a dynamic, on-going policy process surrounding EU ETS reform. The most salient point to take away from this exploration is that on this issue, there were significant disagreements both between stakeholder groups (e.g., between NGOs and the energy-intensive industries) and within them (e.g., the split between Corporate Europe Observatory and the other NGOs). Further qualitative work would be required to fully analyze how important these disagreements were in the still-ongoing agenda setting process. However, it does suggest a starting point for further research on interest group representation in early-stage climate change policy. Measured in carbon dioxide equivalents. Data for 2008-2011 is from EC COM(2012) 652, pgs. 4-5. 2012 data is from IP/13/437; 2013 data is from IP/14/561. 2012 and 2013 data are rough estimates, not exact figures. The structural reform proposal ultimately put forward by the Commission, the market stability reserve, was not on this initial list. pg. 405 in Quittkat, Christine, and Peter Kotzian. (2011) “Lobbying via consultation – Territorial and functional interests in the Commission’s consultation regime.” Journal of European Integration, 33(4), 401–418. pg. 414 in Quittkat, Christine, and Peter Kotzian. (2011) “Lobbying via consultation – Territorial and functional interests in the Commission’s consultation regime.” Journal of European Integration, 33(4), 401–418. Based on the European Environment Agency’s EU ETS Data Viewer. This percentage is calculated by taking the sum of 2013 EU ETS emissions from the following sectors: Combustion installations (71% of emissions, represented by EURELECTRIC and COGEN); refining mineral oil (7%, EUROPIA); production of pig iron and steel (5%, Eurofer); and production of cement clinker (7%, Cembureau). Option A would be implemented either through Option B or C, so it was not included. This entry was posted in Energy & Climate Change, Environment, Politics & Public Policy, The EU and tagged backloading, consultation, DG Clima, ETS. Bookmark the permalink. Previous: What has the EU ever done for the UK environment? Next: How would a ‘clustered’ European Commission impact EU environmental policy?